One of the best things about being a mother is all the imitation your children do of you. Of course I want to protect them from making any of the same mistakes I've made over my years. This next book I was given the opportunity to review, (Oh My, Oh No!) addresses exactly that but in an adorable way. The synopsis says, "I like to be just like Mommy. When I go to drink her coffee, she says, Oh My, Oh No! Coffee is yucky! And when I surprise her with a cake, she says, Oh My, Oh No! There’s flour all over the kitchen! Mommy and I don’t always see eye to eye. But when I go to hug her and she smiles, I know that Mommy loves me. And that’s the most important thing of all." I thought this was a great little book. It was a fun one to share with the boys and was helpful in explaining why sometimes Mommy says no to the same things she does. It also helped me explain that just because sometimes I get upset, doesn't mean I don't love them more than anything in this world! 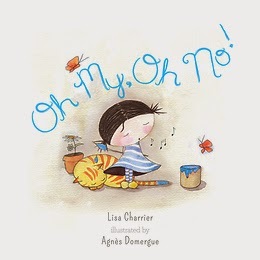 Giveaway: Running Press is going to give one of A Lucky Ladybug's lucky readers Oh My, Oh No! to have of their own!